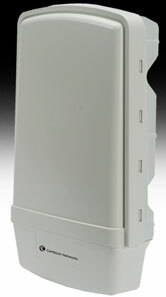 The Cambium-Networks PMP 430 with OFDM technology delivers 40+ Mbps throughput, ranges up to 30 miles (48 km) and near-line of sight (nLOS) performance for reliable and secure data, voice and video connectivity. With low one-way latency of less than 3.5 msec the PMP 430 is ideal for sensitive voice and video services. SMs can be upgraded from 4 Mbps throughput to 40 Mbps via a software key system to meet customers'' growing need for bandwidth.